"This is an important book, as it dispels three misconceptions about policies pursued by Margaret Thatcher: that she was at odds with the Foreign Office on the Israel-Palestine conflict; that she was of one mind with the Reagan administration regarding the Middle East; and that conservatives such as Thatcher automatically support other conservatives, for example, Yitzhak Shamir. Well-researched and well worth reading." "A key value of Bermant’s account derives from his careful reading not only of the official British archives, but also those of the Israeli governments of the time. He shows how each twist and turn in the British government’s efforts to find a route to resolve the conflict was interpreted in Israel." "The first chapter of Azriel Bermant’s outstandingly valuable Margaret Thatcher and the Middle East is titled ‘Thatcher and the “Finchley Factor”’. Like Churchill’s Manchester seat, this outer suburb of North London had a large Jewish population, not universally loved by the local Tories. Thatcher was selected as a candidate thanks to one prejudice trumping another in the local Conservative Association: she might be a woman, but at least she wasn’t a Jew." ‘Margaret Thatcher and the Middle East’ will be published by Cambridge University Press in August 2016. 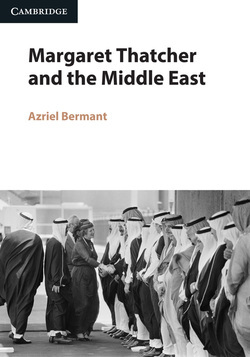 In ‘Margaret Thatcher and the Middle East’, Azriel Bermant questions claims that Thatcher sought to counter the Foreign Office Middle East policy, and maintains that the prime minister was actually in close agreement with the Whitehall bureaucracy on the Arab-Israeli conflict. In particular, the book argues that Thatcher’s concerns over Soviet ambitions in the Middle East encouraged her to oppose the policies of Israel’s Likud governments, and to work actively for an urgent resolution of the conflict. Furthermore, while Thatcher was strongly pro-American, this was not translated into automatic support for Israel. Indeed, the Thatcher government was very much at odds with the Reagan administration over the Middle East, as a result of Washington’s neglect of the forces of moderation in the region. The reverberations of this policy failure are still being felt today in the Middle East. The book sheds new light on Thatcher’s relationship with Reagan, and its unique perspective on Britain’s role in the region will appeal to those interested in Middle East history, the Arab-Israel conflict, British foreign policy and transatlantic relations. It will also be valued by those interested in the wider debate over Thatcher’s legacy in international affairs. You can read a complimentary Chapter  of 'Margaret Thatcher and the Middle East', courtesy of the Margaret Thatcher Foundation. The chapter includes the recently discussed episode of Israel's bombing of the PLO HQ in Tunis in October 1985 which was condemned by Thatcher. Written evidence to the UK's Parliamentary Foreign Affairs Committee Inquiry into the Middle East Peace Process, including Dr. Azriel Bermant's submission. Published by the Parliamentary Committee ​on their website.